Please take a few minutes to help us protect Tasmania’s forests. It’s easy. Just click here and fill in your details to send an automatic email to the Japanese companies who are currently purchasing wood from Ta Ann Tasmania. This action was launched today and with the help of our friends at Markets for Change, The Last Stand and the Huon Valley Environment Center, and with your help too, it looks like it’ll be a big one! Lets send the message far and wide. Check out www.taann.com.au for more info. In addition an action took place this morning in a logging coupe in the Picton Valley in southern Tasmania. 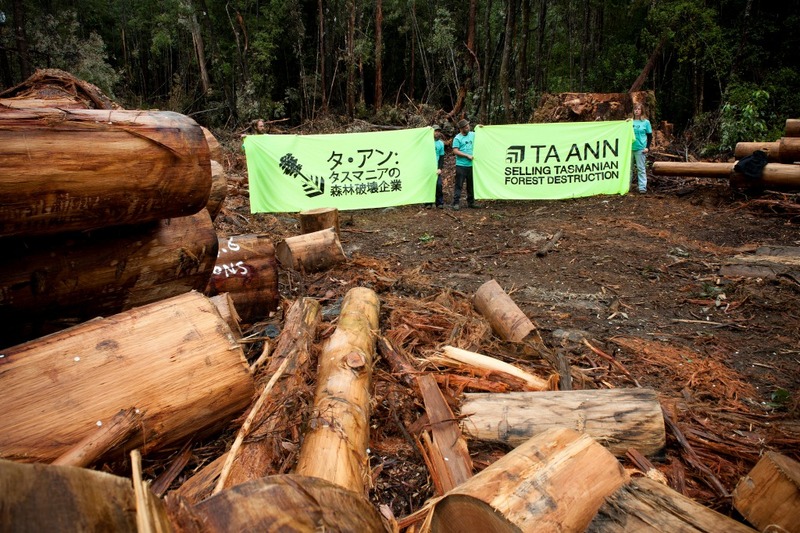 With banner messages in both English and Japanese, the action highlighted the ongoing destruction caused by Ta Ann. The action called on those companies involved (including Sekisui House, Eidai, Daiwa House and Panasonic) to stop selling the products from this forest destruction. Posted on January 31, 2012, in Events. Bookmark the permalink. 2 Comments.